​So, every healthy tree bears good fruit, but the diseased tree bears bad fruit. ​I'm really proud of myself. I've gone almost a whole week without potato chips. Six days and counting. This is a big deal because chips are my weakness. Remember those old Lay's commercials... "can't eat just one", yup that's me. ​As good as they are in the moment, their lasting effect is not good for me. And that one bad eating habit, makes it easier for me to make other poor dietary choices. ​I know this to be true, but maintaining a healthy diet takes a lot of discipline and a focused purpose. Maintaining our spiritual diet is as vital to our spiritual health as maintaining our physical diet is to our physical health. In both cases, what we consume effects how we live our lives. The same is true with our spiritual health. Skipping our Bible reading or study today because it’s Monday and really busy, makes it easier to skip again. Then before we realize, it’s been a month and we haven’t opened our Bible. Missing church because it's cold and wet and more comfortable to sleep in, may not seem unreasonable. But as we let excuses creep in week after week, what seemed a reasonable decision has turned in to a bad habit. So why is missing a day of Bible Study or missing a Sunday at church a big deal? Y’all, I’ve been there, I understand. It can be a struggle for me too. I’m not writing pointing a finger. And I’m not writing just saying we are to do these things because the Bible says so, even though the Bible does say so. I will study your commandments and reflect on your ways. I will delight in your decrees and not forget your word. ​And let us consider how to stir up one another to love and good works, not neglecting to meet together, as is the habit of some, but encouraging one another, and all the more as you see the Day drawing near. ​Maintaining our intake of spiritual food effects the outward expression of spiritual life – how we interact with others, how we respond in stressful situations, and the decisions we make when facing temptation. ​And I really want to be both physically healthy and spiritually healthy. But both take effort and intent. As I begin week two without potato chips, I am also focused on spending daily time in God's Word. Healthy trees bear good fruit... Let’s be healthy trees. 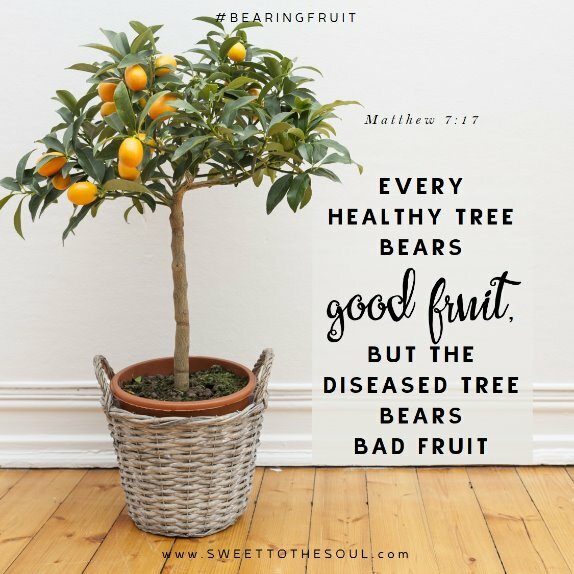 ​If you have enjoyed today's blog, I invite you to join us all month as we talk about #BearingFruit. 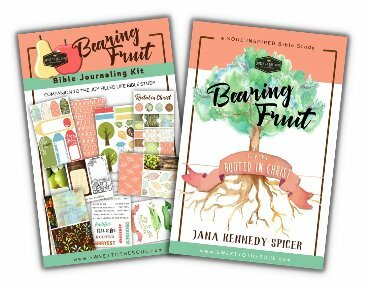 We have a new #SoulInspired Bible Study and Journaling Kit available! ​The Study includes 4 study sessions (today was an excerpt) and a bonus section discussing the Fruit of the Spirit, plus color pages, verse mapping pages, prayer journal pages, and more! Thank you for this! I strive to read the Bible and spend time in prayer daily! I want to remain in loving and close contact with my Lord and Savior! Thank you Jana! I want to be both physically and spiritually healthy. I have some work to do. Oh you and me both sister!! Good word, Jana. Love you and your desire to share His Word!! Love you Gail and thank you for the encouragement!